We generally value the original finish on our antiques and collectibles. 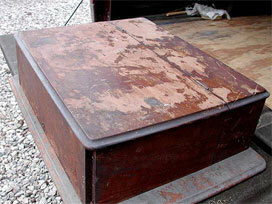 What from what we have read, refinishing often takes away from an antique's value. This poor machine however, has seen much better days and even came compete with a gigantic mouse nest inside. If it had been used by Betsy Ross, we may not have refinished it. 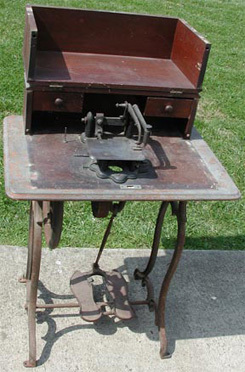 It is one of the few sewing machines we have refinished. These photos were taken after the metal base was removed and before we took it to the John C. Campbell Folk School for a class in furniture refinishing. The machine will never be a working model in our collection, because it requires a curved needle to operate. We are also missing the accessories. We saw another machine in an antique store and it had its accessories. It was remarkable that when it was sold, it had a foot with a glass insert. 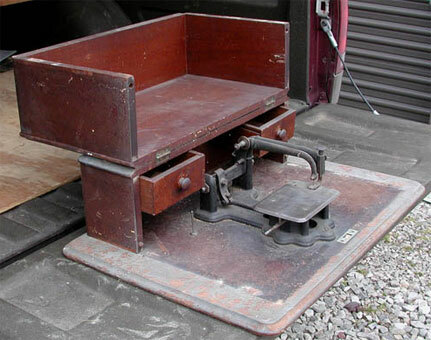 Unlike more modern treadles that use a round leather drive band, this machine used as wide leather belt. We fabricated a drive belt from a man's leather belt but we have belt slipping; we apparently need to work on our belt-making and belt-tightening skills. A main contributor to belt slippage is the machine is very stiff. If we were to lubricate it well and just sit down and treadle for a few hours, it likely would loosen up. Fabric is sewn by moving from left to right instead of the usual front to back movement on most all other sewing machines.